After 10 years of testing and certification the one-of-a-kind Clear Flow™ Water Hose is finally available in the USA Online, and in Home Hardware in Canada. WATCH OUT FOR CHEAP AND HAZARDOUS IMITATIONS! Warning: cheap knock-offs are made from sub-standard, off-shore materials. Look for the Clear Flow™ trademark to guarantee high-quality product made in the USA. Why is The Clear Flow™ The Best Garden Hose? You can now purchase the original Clear Flow™ expandable Garden Hose online in the USA. Are you in Canada? Purchase in-store at Home Hardware. View the store locator HERE. Roger has been in the plastics industry for twenty years and thats given him the insight as to how to create the perfect, expandable water hose made with 100% safe materials. 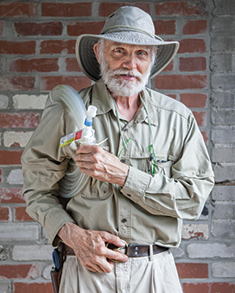 After ten years of testing and certification he invented this drinking water safe hose. The magic in this flat garden hose is the fact that it stretches and expands with the water pressure and has really good memory to return to it’s normal state. It does so by emptying itself. The advantage over any other product like the accordion X-hose, Pocket Hose or your standard rubber garden hose like Flexilla or Flexogen, is that by discharging all the water after use, it remains ultra lightweight. 100 feet of hose weighs only 4lbs making it a manageable, coiled garden hose. This polyurethane material and the materials used to design the garden hose fittings are 100% recyclable. No other commercial water hose on the market can claim that and it is very wasteful. The nylon fittings were created to avoid freezing conditions. Brass conducts the cold, and with a nylon fitting it works more as an insulator so it’s not affected by the cold. Brass fittings on other hoses also contain lead, which has been proven hazardous and will not pass certification for drinking water safe. The nylon fittings are virtually crush proof and these flexable hose fittings are drinking water safe. You can run them over in your car and they won’t be destroyed. All of these components make the Clear Flow™ Garden Hose the best garden hose in the world! Professionals in the Home and Garden industry that have used all kinds of water hoses, retractable garden hoses and heated garden hose products will stake their reputation on the line defending this expandable garden hose. Roger’s Google+.